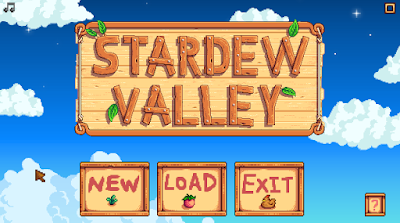 Behold, the lovely Stardew Valley! Home to a quaint collection of country folk (many of them with some surprisingly urban tastes), this little land is your brand new home. Will you create a successful farm, and become the most bustling businessperson evar? Will you woo one of the locals and raise a family? Or will you delve into the secrets of the Valley, and learn more than you bargained for...? Stardew Valley is a farming simulator. It's adorable. Play it. Do you have a walkthrough for the following two quests? Not yet, no. Every walkthrough I've completed is up. I don't know where the Basket is, but I've heard the 'shorts' are at Marnie's house, and you need to befriend her to get into her room. Haven't gotten around to that yet. You can go left on the busstop screen. You will find the basket on the far left of the next screen. 1- You need to upgrade your house with a kitchen. 2 - You need to build a barn and purchase a cow. 4 - When you have collected all this and you have learned the pink cake recipe from the cooking show on your TV you can make your pink cakes by right clicking on your stove in the kitchen. *Note - you must have all 4 ingredients in your inventory for it to work. Simply right click on the picture of the pink cake and you can collect as many cakes as possible as long as your supplies do not run out. 5 - Then you gift two per week to Marnie until you have earned three hearts. 6 - Then you can enter her room and gather the shorts. sugar and Wheat flour - purchased at the general store in town. Blackberry Basket can be found by going to the bus stop and following the road west, it's just next to the tunnel entrance. You dont have any info on Maru? Hopefully coming today. Give her lots of precious minerals and check her house / the clinic when she's working, in a nutshell. Do you think you could make a list of important people to befriend? So we can know who is worth the effort to get certain quest/items/unlockables. Uhh, we'll see. That's last on my priority list. I CAN say, though, that it's in your interest to befriend just about every NPC who isn't a bachelor or bachelorette. They send you recipes in the mail, and you need to make all of the recipes to get one of the achievements. Assuming that's important to you. I can't really think of an item besides recipes that you'd get from an NPC that you can't get somewhere else, really. Even if you befriend them you still have to hope on random chance that they send you a gift. i don't see the quest "rat problem"
Right, that quest that didn't exist when I started. I won't have time to do it for several days. Check the Community Center article for details on how it's done - all you have to do is look at the golden scroll, really. Is there anything to do at the train station or the baths? anyone know what to feed to the Sand Dragon ? How do you get the purple mushrooms? An amazing post for me like a newbie person About carving on wood and carving furniture for home. I am using some cheap tools for carving on furniture and my team enjoying a lot these tools. For my Customers these tools are very fast to do a new job so you will try your recommendation soon. My carved wooden furniture website always usable for new furniture ideas my customers getting occasionally. Thanks for sharing such a good post. Will try your tips and recommendation.